We’ve had student written stories from all over the country. Join our stable of writers. 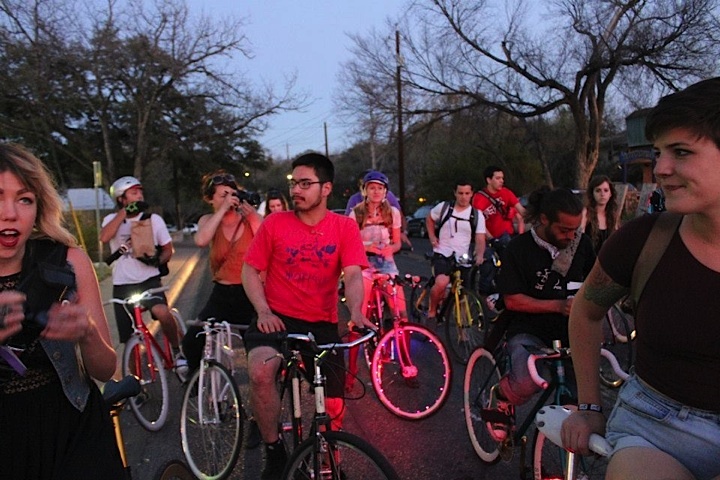 Curbing Cars is telling stories of how people are rethinking the way they get around. And who better to tell those stories than you? We offer these opportunities for you to write for us. Send your ideas to curbingcars@gmail.com. All submissions should be 500 words or less. We welcome photos and video. Include a phone number in case we have questions. Before you pitch us a story, read the Columbia Journalism Review cover story about us. Also, take a look at our site so that you don’t duplicate a story we’ve already written. We also do not accept stories that you have written for other publications, except your own blog. A row of Bixis stands waiting for lunchtime riders in Montreal. 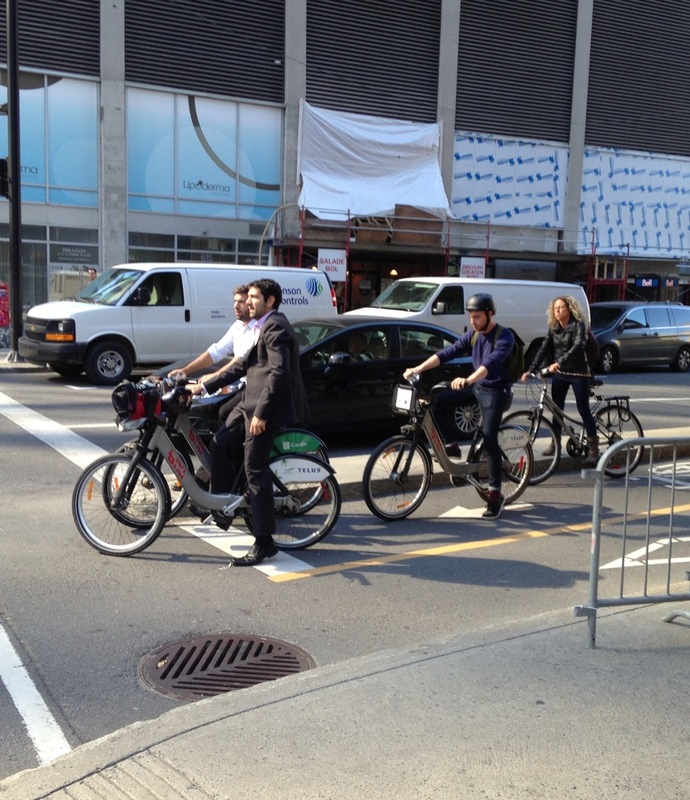 These Bixi riders and cyclists at lunch in Montreal. Only one of them is wearing a helmet. 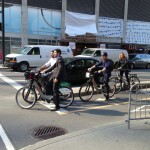 At rush hour, just one Bixi was available near the Atwater station of the Montreal Metro. 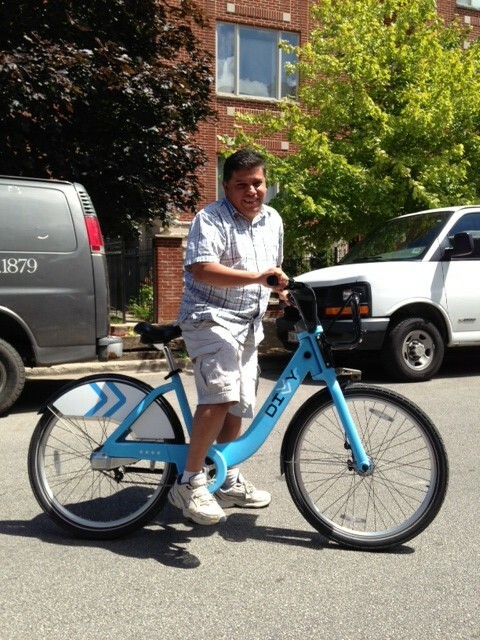 One lone Bixi bike in Toronto. 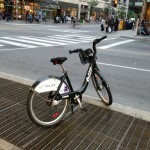 During my week in Montreal and Toronto, I had my eye out for evidence of bike sharing. I didn’t have to look far in Montreal, which is considered one of the world’s top bike friendly cities. Toronto was a much different story. In fact, it hadn’t even taken me that long to find them. 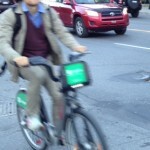 As soon as my taxi pulled out of Montreal’s central station, I spotted a man on a Bixi waiting at the light. 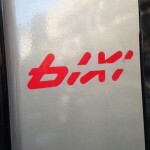 Over the next few days, I spotted Bixis in all the neighborhoods I visited, at all times of the day, even late in the evening after I was coming back from dinner. 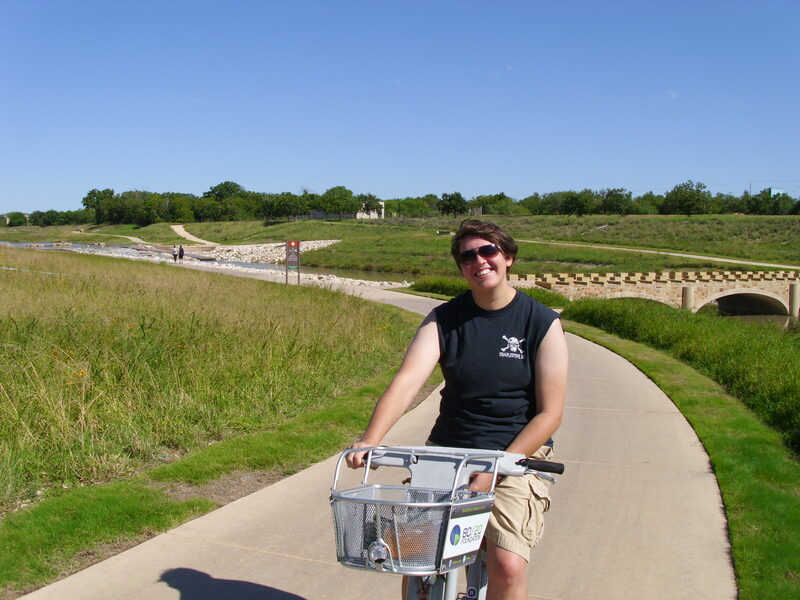 People rode Bixis to lunch, and to work, and out for drinks. 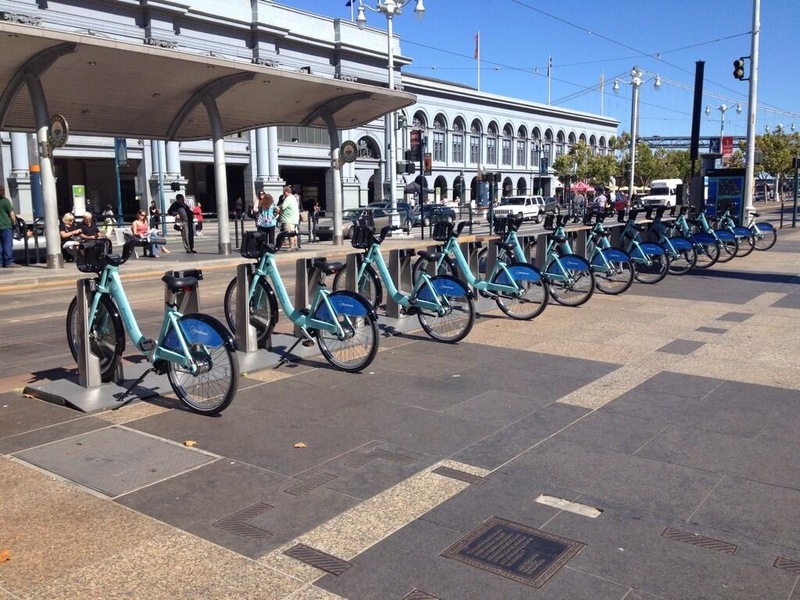 Late one afternoon, I passed the Atwater Bixi dock and found it held just one bike — all the others were in use. Ahmed El-Geneidy, associate professor at the School of Urban Planning at McGill University, smiled when I told him that. 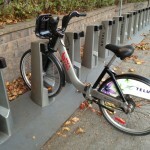 Montreal, he explained, is the equivalent of a model home for Bixi, the bike sharing company that dominates the world market. 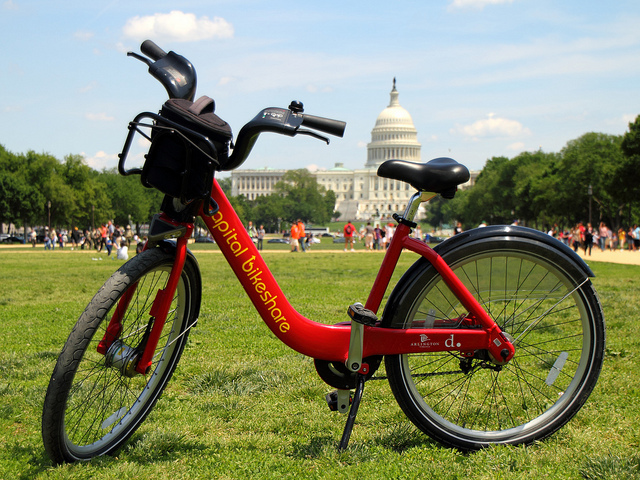 It constantly brings visiting civic officials to the city to see bike sharing in action. 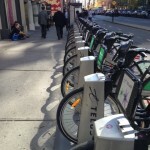 So, naturally, Bixi docks and bikes are plentiful. Denver is known for its Nuggets, the Broncos and its mountains. 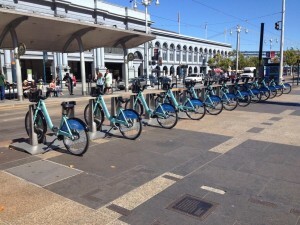 But many of us don’t automatically think of it as a bike sharing city. 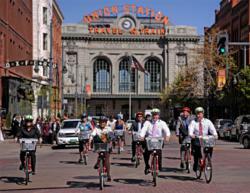 However, the system known as Denver B-Cycle has a regular rider in Tim Baldwin, an associate with the transportation consulting firm of Steer Davies Gleave. Here is Tim’s B-Cycle review. “Our firm recently moved to a new office in the Lower Downtown area of Denver. While it is a beautiful office in a wonderful location, it is about four blocks away from Denver’s 16th Street Mall and its free shuttle bus, which we use to get to and from meetings around downtown (primarily at RTD-Denver and the City and County of Denver).